Indian restaurants in London have tended to go through periodic and repeated rebirths over the past few years, with numerous attempts at moving the cuisine on from the curry house clichés that it’s fallen into with varying degrees of success. 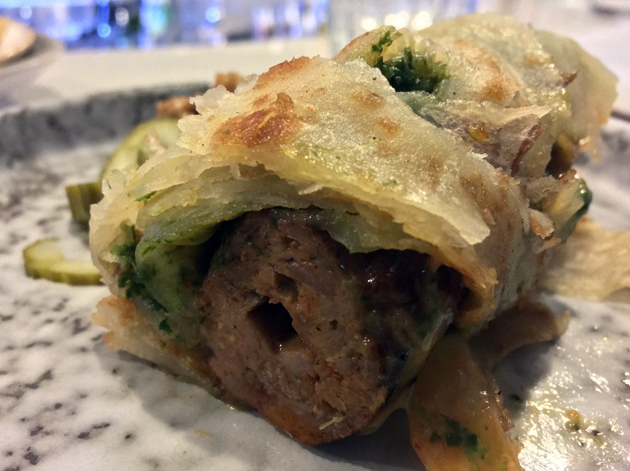 The most recent wave in the capital have tended to concentrate on little-known regional cuisines and more geographically generic small plates designed to be taken with booze. Kricket Soho falls into the latter category and is a bigger, glossier incarnation of the Brixton original. The ground floor counter surrounding the open kitchen is for walk-ins; the basement dining room takes reservations for groups of four or more. I can’t tell you what the latter is like, but the counter was a surprisingly pleasant perch with comfy stools (actual lower back support!) and an enveloping warmth that managed to effectively cosset me against the cold, despite being seated near the front door, as long as other diners were around to lend their collective bodily warmth too. 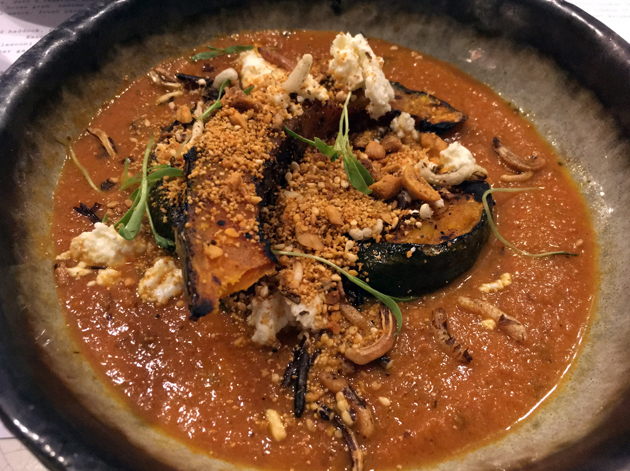 Kricket’s decidedly non-traditional dishes might seem like a cop-out at first, but its menu definitely shouldn’t be dismissed out of hand. Bone marrow kulcha usually comes with ceps as well, but the mushrooms were off on the night of my first visit. The thin, light and elastically soft bread was still texturally pleasing though, while the bone-marrow manifested itself as an occasional slick of meaty run-off. This bovine ghee, if you will, could’ve been bolder and more consistent in its application, but this was still a winsome start. This review’s procrastination was brought to you, in part, by Motley Crue. Small but firm and sweet slices of pumpkin came bathed in a creamy, occasionally tart sauce dotted with crunchy, distinctly flavoured hazelnuts. Although the wispy paneer didn’t leave much of an impression, everything else about this vegetable curry was elegantly done. The small gaggle of trad curry houses that used to cluster on this small stretch near Piccadilly appear to be dying out. Slowly. Occasional hits of smoky, flesh haddock dotted the kedgeree. But what really stuck out were the intense hits of saffron in the squidgy medium-grained rice, punctuated by sharp, thin shavings of cauliflower. With such a dynamic pairing, I could easily overlook the ineffectual raw egg on top. 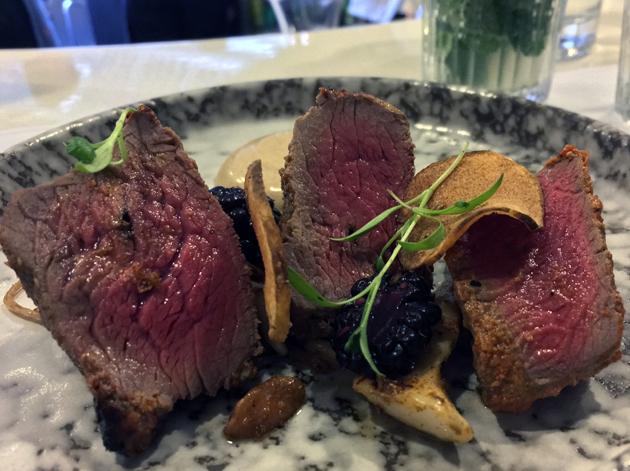 The artichoke crisps and pickled blackberries accompanying the venison rump left me unmoved, but the deer meat itself was impressive. The firm yet yielding chunks of venison tore apart under the pressure of my teeth with just the right amount of resistance, providing a neat conveyor for the coconut-infused wet rub. Burnt onion raita on the side had a sharp earthiness to it, but this tended to overwhelm the rump. While seductive in its own right, it neither complimented the venison or served as an effective palate cleanser which made it somewhat redundant. Sorry folks, I forgot to take a photo of the kedgeree. After a superb savoury trio, the dessert of jaggery treacle tart was especially disappointing. The filling wasn’t as distinctively fluffy and sweet as I would expect from something made with jaggery. The thin pastry, sitting somewhere in between puff and filo, was a bit too chewy for my liking. The milk ice cream had a clean aftertaste, but the crunchy ice crystals was yet another misstep. 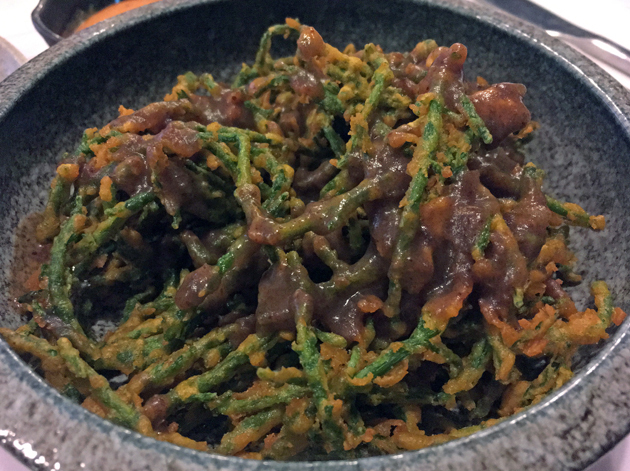 Kricket’s samphire pakoras were a world away from the stodgy clodden patties that pass for pakoras in most Indian restaurants. The clearly extant samphire spears appeared to have merely grazed the deep fat fryer as they were only lightly dotted with patches of batter. The level and consistency of crispiness was top-notch though, with the crunch of the green and brown interspersed with blobs of lightly fruity date and tamarind chutney. The tamarind taste could’ve been a bit stronger, but the lightly citrusy and salty tickle of the samphire and the garlicky mayo on the side helped pick up the slack. I do like a salty tickle. The meatiness of langoustines is obviously dependent on the catch, but even when it’s meagre, as it was here, the kitchen more than makes up for it in other ways. 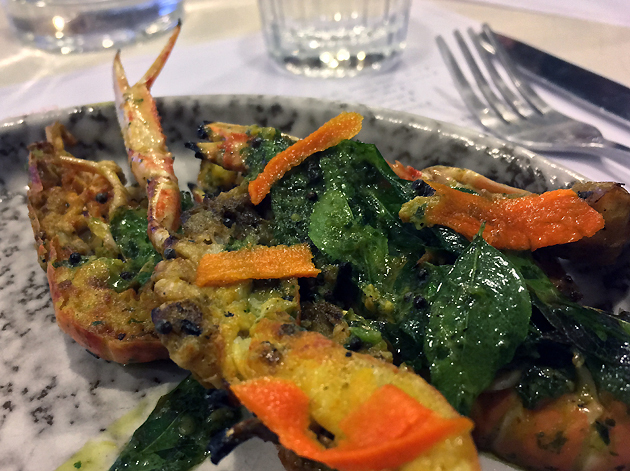 The smoky, mustardy, woody tingle of the spices slathered all over the langoustines was not only nuanced but deeply addictive too. 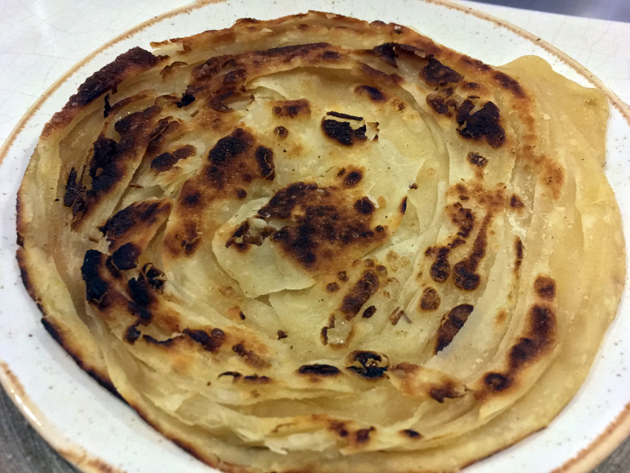 The paratha was an exemplar of this type of bread – thin, soft, flaky and gently buttery. It also forms an integral part of the kathi roll, where it’s wrapped around a plump, moist and lightly earthy seekh kebab made from duck. It looks like a mildly exotic sausage roll and its seeming simplicity belies its deliciousness. The somewhat overpowering peanut chutney on the side isn’t really needed and sticks out like a sore thumb, especially as the slices of pickled cucumber aren’t really sharp enough to cut through the chutney’s wollop. Still, these blemishes can ultimately be overlooked given the kathi roll’s general excellence. Seekh and ye shall be rewarded. 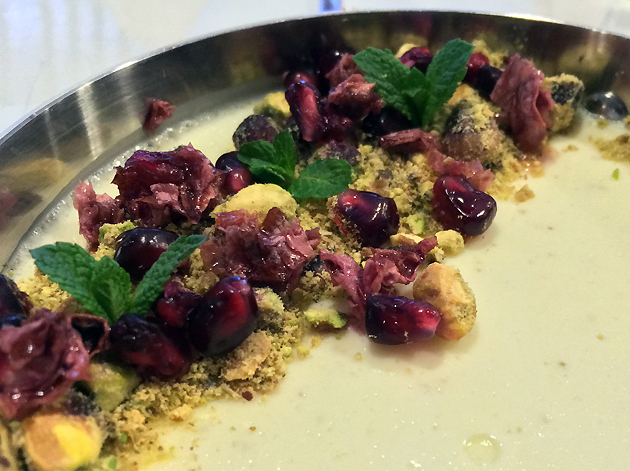 Misti doi sounds like the title of a Sigur Ros song, but was actually a superlatively creamy and modestly thick panna cotta-esque pistachio-flavoured dessert. 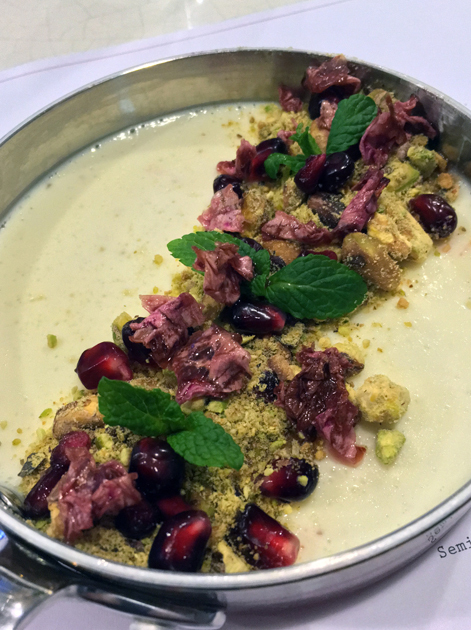 The crunch of extant pistachio pieces and sharp pomegranate added textural contrast to the smooth custardy cream, while refreshing mint and a tint of rosewater brought some variation in flavour without being overpowering or cloying. 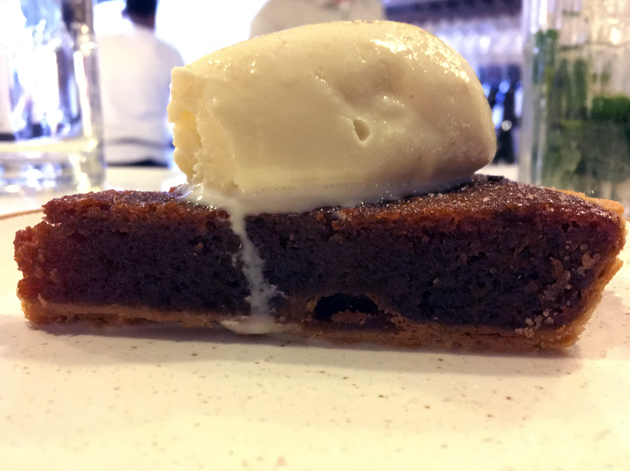 This superlative dessert only makes the jaggery treacle tart look all the more mundane. Think of it as a thick, almost spreadable yoghurt. 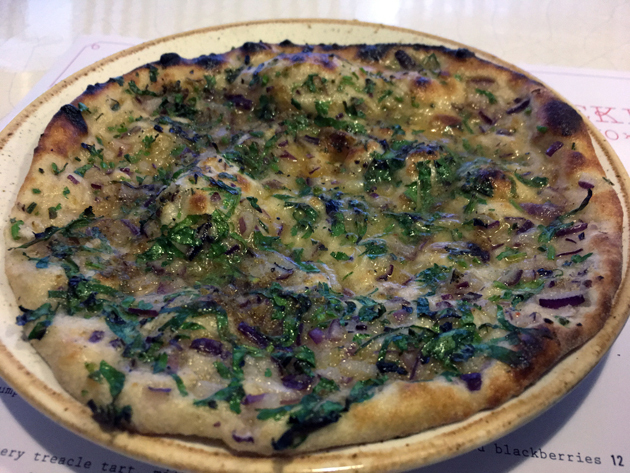 While the masala kulcha looks like nothing than an embellished version of the bone marrow kulcha, it was a much better beast. The bread was still thin and soft, but had a more pronounced gentle chewiness compared to its stablemate. That would’ve been more than enough on its own, but it was made even better with umami and fruity tones as well as a hint of tartness. A truly superlative bread in every way. A green-and-black worth caring about. 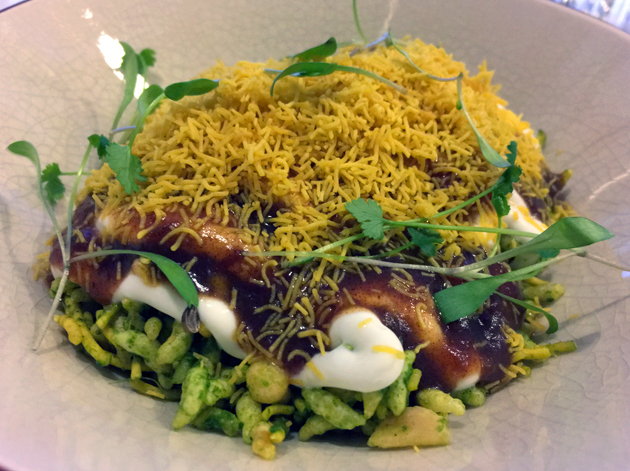 Kricket’s bhel puri wasn’t stodgy, crunchy hard or oddly bland like other renditions of this classic Indian snack elsewhere. Puffed rice was crisp, yet somehow also fluffy, with hints of fruitiness and came layered with creamy, refreshing yoghurt for a light yet flavoursome start that still managed to take the edge off my hunger. Let the bhels ring out. Plump and fleshy mussels didn’t have the salty zing I would’ve preferred, but the thin yet sharp and lightly zesty sauce more than made up for it. 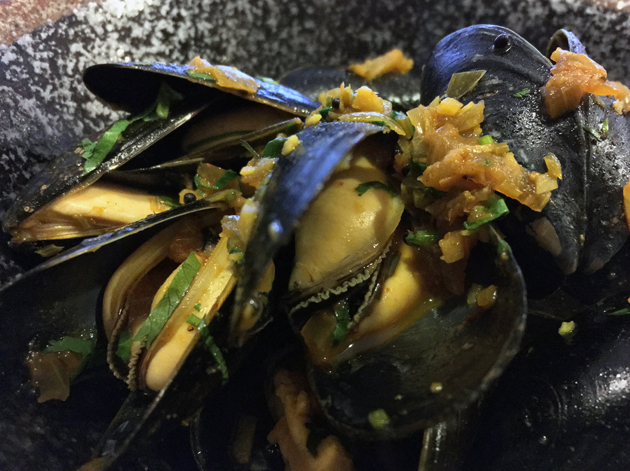 It wasn’t as viscerally sensuous as the mussels sometimes available at Breddos Tacos, but it’s still a fine bowl of molluscs nonetheless. This may be controversial, but I reckon that Kricket’s lamb haleem is better than the version of the dish I’ve had at Tooting’s various South Asian restaurants, such as Spice Village. 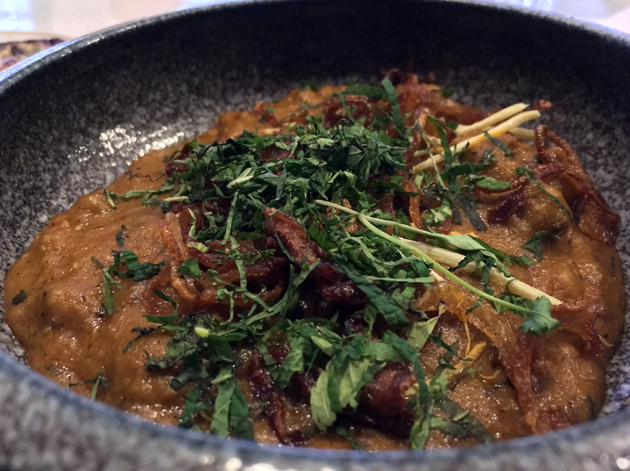 Rather than a formless, charmless meat puree that tasted far too subdued, the haleem here had sinewy, tender chunks of lamb that I could sink my teeth into. The crunch of fried onions provided textural variation and contrast. The unctuous sauce/meat puree, meanwhile, had the zing of ginger and a cumulative heat that crested to a tingly finish. There’s bog-standard curry and then there’s stuff like this that makes you feel glad to be alive. The misti doi was just as good as it was before. Some might lament Kricket’s lack of strict adherence to the subcontinent’s gastronomic canon, much of which remains unexplored unless you venture outside of zone 1, but that shouldn’t deter you from eating at this splendid restaurant. 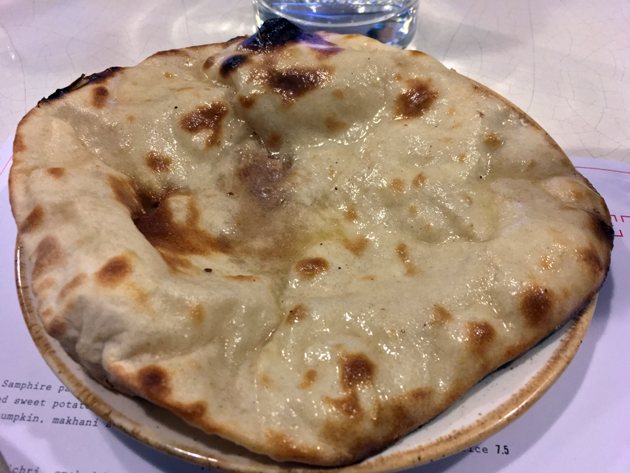 Old-school curry houses hybridised Indian food due to a lack of expertise in their kitchens, culinary conservatism among their clientele, difficulties in sourcing ingredients or some combination of all of the above. None of these limitations apply to Kricket, where the primary motivation appears to be a desire to innovate with delicate, layered spicing and quality produce. If that isn’t something to applaud and reward with repeated custom, then I don’t know what is. Opening Hours: Monday-Saturday noon-14.30 and 17.30-22.30; closed Sunday. Tags: bhel puri, bread, curry, jaggery, kebab, kricket, langoustines, london, mussels, pumpkin, restaurant, review, roll, samphire, soho, tart, venison. Bookmark the permalink.